The prices are extremely good too. Compared to online and even at the vegan cafe/shop VX. 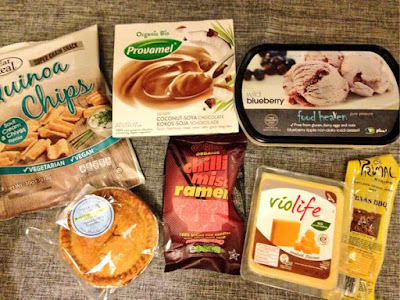 As for my haul - the only thing I'd tried before was the quinoa crisps - dairy free, vegan sour cream and chives - my absolute favourite. The other products were all fantastic too. The food heaven ice cream was served to my family and they couldn't tell it was dairy free, the Voakes pie was delicious (how do they make the crust so buttery?) and even the vegan jerky was amazing (like, how?) I think that will be going on a pizza in the very near future! On the subject of pizza, smoked Violife cheese! And in a larger pack too. It goes with everything and is brilliant on a cracker with a blob of chutney. The yoghurts were dark chocolate and coconut. It's just so good to try different flavours after so long.